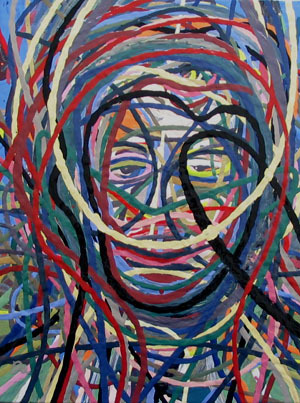 Lyrical Expressionist Enamel Paintings - By Bernard Re, Jr.
Background: "...According to string theory, absolutely everything in the universe - all of the particles that make up matter and forces - is comprised of tiny vibrating fundamental strings. Moreover, every one of these strings is identical. The only difference between one string and another, whether it's a heavy particle that is part of an atom or a massless particle that carries light, is its resonant pattern, or how it vibrates..." More about Brian Greene.